The CONJURING universe has been a massive success for Warner Bros., amassing more than $1.5 billion in worldwide ticket sales over the course of five movies. It makes sense that the studio would want to continue building on the legacy of the franchise — and not just through traditional sequels structured around Ed (Patrick Wilson) and Lorraine Warren (Vera Farmiga). There have been spinoff stories set in the CONJURING world, from ANNABELLE and its terrifying prequel, to the story of THE NUN, set several years before the Warrens even walked on the scene. And next weekend, yet another movie with loose connections to the CONJURING story arrives in theatres. Titled THE CURSE OF LA LLORONA, the movie establishes a new campfire tale, this one about a woman who murders her own children, and then spends an eternity collecting the offspring of innocent victims. It’s a terrifying myth, one used by parents to scare their kids into behaving properly. 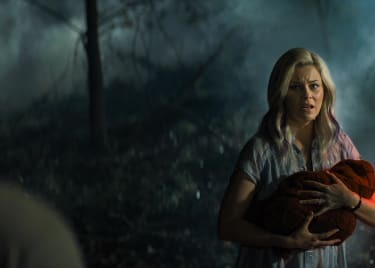 “Listen to me, or La Llorona will come get you in the middle of the night.” Only, in this new movie, La Llorona does start showing up, and people begin to disappear. In the movie, Linda Cardellini plays a social worker trying to get to the bottom of the La Llorona myth. While investigating, her path crosses with Father Perez (Tony Amendola), a character who appeared in the first ANNABELLE movie. He recounts the story of the possessed doll to Cardellini’s concerned character, establishing for certain that THE CURSE OF LA LLORONA takes place in the same universe. We even get a very brief cameo of the doll being carried through a scene. 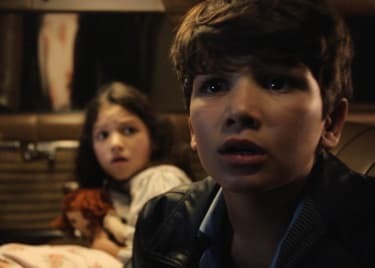 So, completists of the CONJURING universe who want to know every thread that connects the movies in the franchise will want to scour THE CURSE OF LA LLORONA, not just for the ANNABELLE mention, but for other Easter eggs that you know producer James Wan likely helped sprinkle throughout. This is just the continuation of the ever-growing story, and there are more movies to come. ANNABELLE COMES HOME is scheduled to open in theatres on June 28 of this year, while THE CONJURING 3 has a 2020 release date on the calendar. Stay up to date with all of the happenings in the horrific CONJURING series by grabbing your tickets to Michael Chaves’ THE CURSE OF LA LLORONA today. The film stars Linda Cardellini, Raymond Cruz, Patricia Velasquez, Sean Patrick Thomas and Marisol Ramirez as the ghost of the title. Look for it in theatres starting on April 18. Linda CardelliniMadeleine McgrawPatricia VelasquezMichael ChavesHorrorThe ConjuringWarner Bros.